If your personal licence was issued on or before 1st September 2009, its important that you take note and act now! 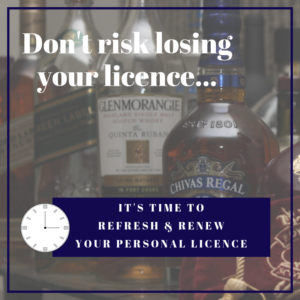 When you were issued with your Personal Licence, you were advised of certain responsibilities, which include completing refresher training every five years and applying to renew your licence every ten years. All Personal Licences which came into effect on 1st September 2009 will expire on 31st August 2019. This means that it’s time to complete your refresher training and then submit your renewal application. The window for applying to renew a Scottish Personal Licence has already opened and closes on the 31st May 2019. However, as there will be a huge influx of applications, its better to apply for your training sooner rather than later. 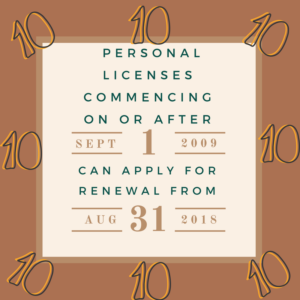 “A personal licence has a currency of 10 years and must be renewed prior to the 10th anniversary of issue by a licensing board. In addition, Section 87 of The Licensing (Scotland) Act 2005 requires that prior to the 5th anniversary of issue, and every 5 years thereafter, the licence holder must undergo mandatory refresher training, where a refresher training certificate will be issued on successful completion of the training course. Failure to undergo this training in the appropriate timescale and failure to update the licensing board within 3 months of the training will result in the licence being automatically revoked. The Scottish Government has just recently issued its guidance for Personal License Holders due to renew their existing 10 year Personal License in 2019. If your personal license was issued on or before 1 September 2009, this applies to you and you need to act now! As there are very few training providers in Argyll & Bute, training courses are likely to be at a premium. The required training to reapply for your new 10 year Personal License is the completion of a 3 hour Refresher training course and successful pass of the subsequent exam. NorthStar Consultancy is advertising monthly bookable workshops and exams at The Rockfield Centre, Oban.